Posted by claireblang in 2008 Season, Breaking News, NASCAR. DAYTONA BEACH, Fla. (Aug. 27, 2008) – NASCAR announced today that it has placed Kyle Busch and Carl Edwards on probation for the next six races in the NASCAR Sprint Cup Series, as a result of their on-track incident last Saturday at the conclusion of the race at Bristol Motor Speedway. Ok talk about it amongst yourselves and either email me at insidercbl@aol.com or join me on “Dialed In” today and we’ll discuss it on air. By the way – what the heck does probation mean? Anything? Posted by claireblang in 2008 Season, Breaking News, Controversy, NASCAR, Teams. Image by Getty Images via Daylife Q: Did Toyota have any knowledge of what happened prior to the dyno test? Q: Are you furious that you didn’t know about this decision? Q: Is this a slap in the face to NASCAR for adding the plate a few weeks ago? Q: Who called you last night regarding what happened at the track? Q: Is there a time frame in which you will take some action within the team? Q: Is there any indication that NASCAR will respond with a severe penalties? Q: Do you believe what people have said that the Toyota ‘advantage’ has become a ‘disadvantage’? Q: How much power have you gained back since the new tapered spacer? Q: Do you believe NASCAR has put the Toyota teams in this position because they gave Toyota too much initially? Q: Will you still field two NNS cars the rest of the year? Who could be the crew chiefs for those two cars? Q: Do the individuals you believe were responsible also work on your Sprint Cup teams? Q: Does this fall on the crew chief no matter who in the organization did this? Q: Did the drivers have anything to do in this whole issue? Posted by claireblang in 2008 Season, Breaking News, Drivers, NASCAR. Casey Mears (Driver of the #5 Kellogg’s Carquest Impala SS) addressed reports that he is the top candidate and will take the fourth ride at Richard Childress Racing when he leaves Hendrick Motorsports next season. Today (Sunday) he clarified his current progress on plans for ’09 which seem to be fluctuating as negotiations continue. Q: WHAT IS THE LATEST ON YOUR SEARCH FOR A NEW TEAM BEGINNING NEXT SEASON? MEARS: “Just looking. Right now, nothing is done at all, still talking to a couple of different teams trying to get it sorted out. Obviously there is a lot going on and things have been said this week, but nothing is signed. I am still trying to figure out what is going to be the best possible program for myself. Q: DO YOU FEEL LIKE YOU HAVE GOOD CHOICES? MEARS: “There are a couple of good teams. I mean, all of them right now are good choices, just depends on how you look at it. What the potential is for the future versus where the teams are right now. There are teams that have room for growth and a lot of potential for the future. There are teams that are ready to go right now. Really, just have got to get sorted through everything right not. Nothing is signed. Q: DO YOU FEEL LIKE YOU ARE A WEEK OR 10 DAYS AWAY FROM HAVING THIS FINALIZED? Q: DO YOU HAVE A PROBLEM DRIVING A CAR AT THE START OF NEXT SEASON THAT DOESN’T HAVE ANY OWNER POINTS? MEARS: “I wouldn’t be real comfortable with that. Obviously I have to weigh out my options and see how things are. When you compare things, you have to compare teams. If you know you are going with a team that is very capable of making those first five races, then it definitely makes things a little bit easier. If you know you are going with a team that maybe in the past didn’t look like it had as good of a shot to make those races at times, you have to weigh out how all that is. As of right now, it is still pretty wide open. I mean there are some things that look good. Don’t get me wrong. I am excited about some things that are happening but right nothing is signed. Q: HAVE YOU NARROWED IT TO TWO OR THREE TEAMS OR DO YOU HAVE A NUMBER? Enjoy the race – I’ll keep you posted on breaking news. Centurion Boats at The Glen – Watkins Glen, N.Y. Image via WikipediaHey all! Good morning. God Bless the troops – remember what 4th of July is really about – and God speed their safe return to America if they are serving overseas. I arrived here in the media center at 8:00 a.m. and there was no one here. I’ts July 4th and I guess everyone figured the garage doesn’t open until 9:00 and it’s a holiday. I wanted to get in early and write you all a note and get some things done before everything starts cooking here. The big Hendrick driver announcement will be today at 12:30 p.m. (I’ll have an update on the sports nation (Channel 144) during the breaking news update right after 12:30 p.m. – It’s funny – almost everyone in the garage has talked about Mark Martin joining Hendrick Motorsports in the #5 car -in a round about way. ARE YOU TRYING TO PULL THE LAST FEW PIECES OF ADVICE OUT OF MARK MARTIN BEFORE HE DOES WHATEVER HE IS GOING TO DO? “Yeah, but I’ve talked to him about it and he is still the same Mark Martin. He’s going to be at the race track and if anything, it would almost be better because now weekends that I’m in the race car, he’s going to be in the race car too so I can walk over and grab him and speak with him for a second and ask him if his car is doing this or that or whatever. He’s been a big help for me this year with stuff on and off the race track, but I think he’ll be just as much of a help to me for the rest of my career. He’s a phenomenal race car driver and he’s taught me a lot and hopefully he doesn’t stop teaching me. DALE EARNHARDT, JR.: They haven’t announced anything yet. Mark’s a great racecar driver. He’s done a great job driving the No. 8 car this year. He’s a veteran that all the guys look up to. He’s a great tutor for the sport, for young guys. I think that anybody that gets a chance to work with him can learn a lot. DALE EARNHARDT, JR.: A lot of different reasons. You know, it’s really hard to put it down, I suppose. As tough as the schedule is, it’s pretty hard to just stop and not do nothing or do something else, I suppose. Q. Is there still something you could learn from him? JEFF GORDON: You know, I learn from everybody. But I absolutely will learn from Mark. Mark has amazing patience, but he has amazing drive and commitment. You know, you look at the shape that he’s in. You know, there’s not too many guys – I’m not saying he’s old – I’m just saying not too many guys are out there, you know, or have been out there in the past at his age that are as competitive as he is through all the changes that have gone on through cars, teams, everything else. You know, that to me is one of the many things I admire about him. Do you think Mark Martin is capable of winning a championship at his age? What is inside of an athlete that makes you want to keep doing this forever? On the Mark Martin thing, If I remember correctly, he never said retire. Just cutting back some after all the years of 36 and 37 races. Besides, if all the so called Mark Martin fans who called in yesterday bitching and complaining about him going to Hendrick, first they should be mad at Jack Roush for not working with him on cutting back, second it’s not even confirmed as of yet that he is going to Hendrick……………..ok so we all know that, that is what’s going to be talked about tomorrow. Shoot, the man has the right to race where ever and for who ever he wants or will hire him. Any team would be foolish not to hire hime, part time or full time. Just my 8 cents worth. Happy 4th to you, be safe and careful in your travels. Were going racing this weekend……………well all right tomorrow night in the Camping World West at Irwindale. Will keep you posted on the results. Maybe the reason that they are so hard on Mark is because if you listen to some of his interviews, he always say that he loves this team or that team that he is currently on. Fans like drivers to stay with one team for alittle while. It is hard to follow a driver if there only in the car half of the races and they don’t get to see there driver all the time. My personal feeling is that it doesn’t matter. Mark Martin is a great driver either way. With Tony Stewart it might be alittle different because it Tony decides to change teams there is a real good chance that Home Depot would go with him. Fans would not have to change that much. Maybe only the number. DO WHAT MAKES HIMSELF AND FAMILY HAPPY!! HE WILL GO OUT ON HIS TERMS AND HIS TERMS ONLY!! SO ADD ME TO THE LAY OFF MARK MARTIN LIST!! A DALE JR FAN IN N.C.
I’m all for what Mark Martin wants to do……..I just hope he know’s and understands what he “signs on for” since Rick Hendrick’s record shows he dumps drivers when something else better comes along……….”driver beware”. I just went out to listen to your show.Now what is your opinion. Same as Mark Martin. are you glad that Bret is talking about coming back? or should he just stay retired? Mark said he was done and now he is still out there racing. Is it money or just the drive to drive? I used to like Mark But his flip floping makes me want to puke. Or does money Talk and b.s. walk? Yes i want Bret Back. He is Packer Football. But i think he should just be done and go to the Hall of Fame in 5 years. OK, I won’t bug anymore on this, but who didn’t hear retirement? Yeah, it’s his decision and it’s a bad one. I’ll be back later after the Hendrick announcement with details here. Or, if anyone sneezes in the garage (which opens in ten min) I will let you know. Happy 4th of July- be safe and enjoy! Posted by claireblang in Breaking News, Drivers. Image via WikipediaHere’s some news for you to sip with your coffee today – something for K. Earnhardt fans. I’m headed to the airport to fly to Orlando and then Daytona. I’ll catch you from Daytona at 4:00 EST from the XM Chevy Mobile Broadcast Unit. Have a good morning and thanks for all the calls and emails and IM’s – you all are the best! For the first time in his career, Kerry Earnhardt, the son of seven-time NASCAR Champion Dale Earnhardt, will drive a Dale Earnhardt Inc. entry in a NASCAR race. Earnhardt will pilot the No. 8 Bass Pro Shops Chevrolet in the July 4 Daytona 250 NASCAR Nationwide Series race at Daytona International Speedway. Earnhardt, who currently works at Dale Earnhardt Inc. as a team liaison, will be making his 70th career start in the series, but only his fifth Nationwide start since 2003. He most recently competed regularly in the Craftsman Truck Series in 2006.It will be Earnhardt’s ninth career Nationwide Series start at Daytona International Speedway. Image via WikipediaNASCAR Sprint Cup Series Team Chip Ganassi Racing with Felix Sabates (CGRFS) announced (Tuesday) that due to a lack of sponsorship funding it will cease operation of the team’s No. 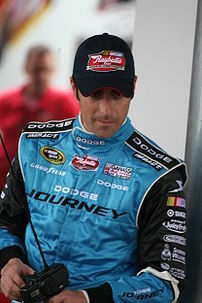 40 NASCAR Sprint Cup Series (NSCS) Dodge driven by Dario Franchitti beginning this weekend in Daytona. Felix Sabates told Claire B. Lang on “Dialed In” on XMSN (XM Channel 144) Tuesday evening that a number “in the low 70’s” of employees have been laid off. Sabates: “Dario had a hard time with it. He made a change from the Indy Racing League to come here. But truth of the matter is he needs more seat time. We gave him an option to go in the Nationwide car because we do have a sponsor for the #40 Nationwide car. He’s going to decide what he’s going to do in the next few days and maybe he’ll be racing in Chicago (Nationwide race July 11)…..I hope he does get in the Nationwide car. He’s a very talented driver and if he gets a few more months under his belt maybe we can get a sponsor for next year and we can go racing next year.